Aldine ISD Spokesman Mike Keeney said that all 70 campuses resumed classes on Sept. 25. Of the 70 campuses, 68 of those returned with power. 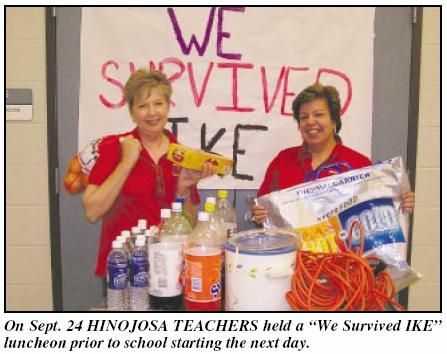 Only Jones EC/PK and Jones Elementary were forced to resume classes on generator power. Keeney said that the district was fortunate in that they had no major damage to buildings. The most damage sustained was to the roof of Nimitz, which was repaired within days of the storm and the press box at Thorne Stadium, which has also been replaced. Last week high school football also resumed. On Friday night Nimitz played Houston Madison. On Saturday MacArthur traveled to Atascocita. The district held a double header on Saturday at Thorne Stadium. In the afternoon Aldine High opened their district schedule against Humble, while Eisenhower played the nighttime game against Kingwood. School resumed in North Forest ISD on Monday, September 29, at all North Forest ISD elementary and middle school campuses except for Oak Village Middle School, Thurgood Marshall Elementary School and Lakewood Elementary School. All North Forest High School students will report to the M.B. Smiley campus for the start of school on Wednesday, Oct. 1. The campus is located at 10725 Mesa Drive. School will resume at the Oak Village, Thurgood Marshall and Lakewood campuses at such time as power is restored to these schools. District administrators and staff members continue to work closely with emergency workers to get these campuses prepared as soon as possible. Additionally, there will be a parent meeting for all parents of students attending North Forest High School. Washington, D.C. – Rep. Gene Greens (D-Houston) legislation to increase domestic energy supplies through expanded offshore drilling and investment in renewable energy and conservation won approval in the U.S. House of Representatives today by a vote of 236-189. Green said his legislation, also sponsored by Natural Resources Chairman Nick Rahall (D-W. Va.) and Rep. George Miller (D-Calif.), would allow oil and gas drilling in federal waters more than 100 miles off the coast and provide for drilling between 50-100 miles off the coast at the discretion of individual states. He said the bill will also: lower energy costs for consumers by releasing oil from the Strategic Classes resume at Aldine, North Forest schools Petroleum Reserve (SPR); increase research, development, and deployment of clean renewable energy and energy efficiency technologies; and invest in critical programs like the Low Income Home Energy Assistance Program (LIHEAP), public transportation, and carbon capture and sequestration (CCS) research. * Releases oil from the SPR. Rep. Nick Lampson (D-Stafford) originally introduced this provision as H.R. 6578, which passed the House in July. It would exchange nearly 10 percent of the SPRs reserve for heavier, cheaper crude oil. This would put more high-quality oil on the market, reducing prices. * Establishes renewable energy tax credits. Similar to bipartisan bills H.R. 5351 and H.R. 6049 passed by the House earlier this year. The bill includes $18 billion in tax cuts to encourage green technology development and energy independence. * Creates a Strategic Energy Efficiency and Renewables Reserve. This was passed by the House as part of H.R. 6 in January. It creates a reserve to pay for subsequent legislation that accelerates renewable and alternative fuel development and use, promotes energy-efficient products, and promotes weatherization and utility assistance. The funds would come from drilling lease royalties. * Allows drilling on the Outer Continental Shelf. Oil and gas leasing off federal waters would be allowed beginning 100 miles off the coast. Individual states would decide whether to allow drilling from 50-100 miles off their respective coasts. Drilling would not be allowed within 50 miles of the coast. National marine monuments and marine sanctuaries will be protected from leasing. National defense areas will be excluded from leasing. The GOMESA law on leasing and moratorium areas in the eastern Gulf of Mexico would be unchanged. * Incentivizes natural gas vehicles. The bill sets a goal of increasing use of new natural gas powered vehicle. It includes tax incentives such as doubling a tax credit for homeowners who install natural gas refueling equipment. * Strengthens energy efficiency codes for buildings. This passed the House as H.R. 3221. It calls on the Energy Department to update codes so that new residential and commercial buildings will be at least 30 percent more efficient by 2010 and 50 more efficient by 2020. This could save consumers $210 billion in energy bills through 2030. * Creates incentives for energy efficient homes. This provision comes from H.R. 6078. It provides incentives for lenders to give lower interest rates to consumers who build, buy or remodel homes to increase energy efficiency. * Invests in public transportation. The bill includes the Saving Energy Through Public Transportation Act, which passed the House as H.R. 6052. It would expand service and reduce transit fares for commuter rail and buses by providing $1.7 billion in grants to transit agencies over the next two years which could benefit Houston METRO. 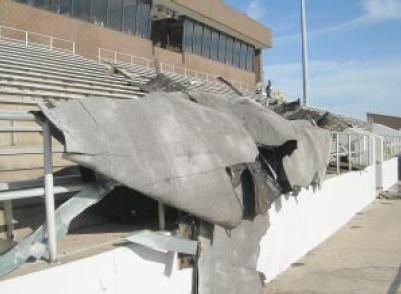 HURRICANE IKE tore part of the roofing off the press box at Thorne Stadium, and it landed in the stands. Damage also was sustained inside the press box. Repairs have been rushed, so that the field could be used for Saturdays games. School finance is always a hot button issue during the Texas Legislative Session. However with rising fuel and consumer costs local school districts are not able to wait for the state to fix the situation and are being forced to raise property taxes. The North Forest ISD will hold an election in December, in which they will voters to approve a rollback rate. Under state law the district raise the rate to $1.314339 per $100 valuation without voter approval. During a pubic meeting scheduled for Sept. 22 the district is expected to ask for a property tax rate of $1.444339. The meeting will be held at the administration building board room at 7 p.m. This rate in broken down into $1.17005 for maintenance and operations and $.274289 for debt service. A comparison of last years budget to this year shows that the district, which has seen its share of financial difficulties, will have a 6.36% in its maintenance and operations budget. Its debt service budget, however, will increase by 12.92%. This budget will be used to pay the $69,163,755 the district has in bonded indebtedness. Documents obtained from the district show that the average property owner will see their taxes go up from $602.04 annually to $729.19 or $127.15. North Forest is not the only local school district facing financial struggles. The Humble ISD will hold an election on Nov. 22, seeking voter approval for a rollback rate. Like North Forest, Humble is seeking a $1.17 per $100 valuation for maintenance and operations. This district said that since 2002 they have cut $27 million from their budget, but that rising costs, frozen state funding and enrollment growth has forced the tax increase. Not all districts will need voter approval to raise their rates. Dr. Keith Clark, Assistant Superintendent for Finance for Aldine ISD, said that they plan to keep their M&O rate at $1.1338. The I&S rate of $.14362 is expected to go up by one cent. The Lone Star College System has approved a 43-cent decrease in the tax rate, lowering it from $11.44 cents to $11.01 cents per $100 valuation. Cindy Gilliam, vice chancellor of business affairs and chief financial officer for Lone Star College System, said the decrease was made possible by the addition of a wealth of new property in the area. The systems territory experienced a 50 percent increase in value from the growth, allowing the college system to lower the tax rate. The college system approved a $219.6 million budget for the 2008-09 year in August and promised taxpayers the tax rate of 11.44 cents per $100 valuation would either be approved as is or decreased. This is the second year in a row the college system has not increased either the tax rate nor the tuition rate. 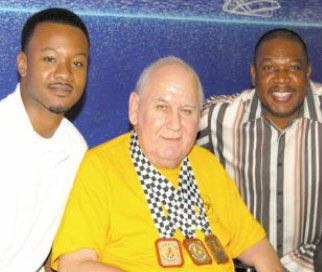 Marvin Zalesky celebrates winning three medals at The Games with coaches Jemarques Handy (l) and Robert Gordon (r). NORTHEAST HOUSTON  Friends and supporters of Texas State Legislator Kevin Bailey are planning an Appreciation Dinner in his honor on Tuesday evening, September 16, to be held at the Crowne Plaza Hotel Houston North-Greenspoint at 6:00 p.m. 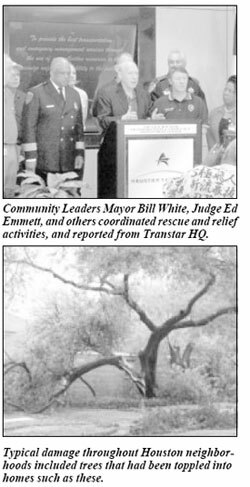 The dinner will be in the format of a Roast and Toast, with colleagues called upon to characterize their remembrances of his 18 years in office, serving residents of District 140. To date, roasters who have agreed to participate include State Representative and Speaker Pro Tempore Sylvester Turner, District 139; Reggie Gray, North Houston Greenspoint Chamber; former County Judge Robert Eckels, Harris County; Charley Wilkison, Combined Law Enforcement Associations of Texas; and Justice of the Peace Dale Gorczynski. Jack Drake, Greenspoint District, will be master of ceremonies. Bailey authored legislation that established the Greenspoint District, East Aldine Management District and Airline Improvement District, all of which are participating in the appreciation dinner. 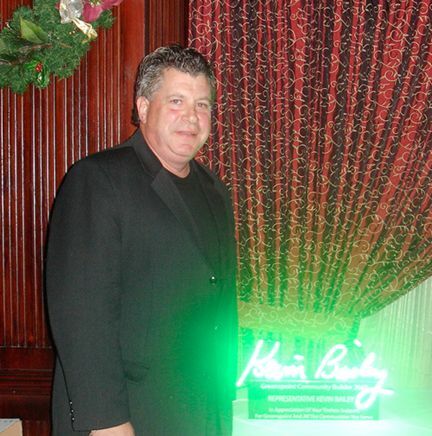 To honor Bailey, scholarships in his name are being established with proceeds from the dinner and sponsorships. Sponsors to date include Crowne Plaza Hotel, developer Dwayne Henson, East Aldine Management District, Plumbers Local Union No. 68, IBEW Local Union 716, Greenspoint District, Airline Improvement District, Hawes Hill Calderon LLP, Locke Lord Bissell & Liddell LLP, Allen Boone Humphries Robinson LLP, North Houston Bank, IBEW Local Union 66, Case Contractors, Aldine Independent School District, Nitsch & Son Utility Co. Inc., State Rep. Sylvester Turner, Houston Apartment Association, GFI Management Services Inc., North Houston Greenspoint Chamber of Commerce, and Swank Audio Visuals. Several hundred guests are expected at the dinner. Ticket prices start at $55, and a table of 10 begins at $750. If you wish to join the evening of fun and appreciation, with accolades, humility and humor  please contact the Greenspoint District at 281-874-2131, or register at www.greenspoint.org. Chamber members heard a full program of speakers last Thursday, at the monthly luncheon of the North Houston Greenspoint Chamber. The featured speaker was Houston Mayor Bill White, who explained that listening to the customer is a good way to run an organization whether it is a business or a city. He elaborated on this theme, talking about the positive values that new businesses coming into the city find: diversity, friendliness, affordability for living. He reviewed initiatives that the city is undertaking to help the quality of life in the city, including reduction of chemicals in the air, lowering of the tax rate every year he has been in office, the Safe Clear towing program on the highways, building of light rail, and the replacement and building of sewer and water lines to keep up with growth and aging infrastructure. To continue to stay ahead of infrastructure needs, he said we need to elect good stewards of our tax money; create a separate fund for renewing of drainage lines; and identify sources of revenue when politicians promise improvements. In reviewing the status of Houston, he noted that during his term, $100 million in infrastructure projects had been completed, and that another $211 million projects have been started. He noted that the economy in Houston remains strong, in contrast to the rest of the country, with retail sales still growing at a rate of 7% annually. Many businesses are still adding jobs, he said, and Houston has a reputation for a work force thats growing and hard working. With more people wanting to live close to their work, a trend is developing for high rise living inside the core of the city. Due to Hurricane IKE scheduled to hit Galveston and Houston Friday night, all Aldine, Humble and North Forest Schools are closed Friday through Sunday. This includes athletic events which were cancelled or rescheduled for Thursday through the weekend. Sheriffs, Constables and Deputies as well as Fire and ESD have gone on overtime schedules to provide services as required. Galveston and Houston are on the direct path of Hurricane Ike, which is now a Category 2 hurricane. The whole city of Galveston is expected to be completely flooded and under water. A 20′ high water surge is expected to wreak havoc on low lying areas near the coast. Inland areas, such as Aldine, Humble, North Forest, Greenspoint, and Beltway areas, are expected to sustain heavy wind and flood damage. Evacuation routes are relatively open with minimal traffic delays. County Judge Ed Emmett has recommended US290 to Bryan and US59 to Lufkin as good exit routes. Also available, but with some delays are US45 north to Dallas, and I-10 west to San Antonio.